Mandarava (Skt. Mandāravā; Tib. མནྡཱ་ར་བ་, Wyl. man+dA ra ba) (8th cent.) aka Machik Drubpai Gyalmo — one of the five principal consorts of Guru Rinpoche, she was an emanation of Dhatvishvari and a princess of Zahor. After leaving the palace out of disgust for samsara, and joining a nunnery, she met Guru Rinpoche who gave her teachings. 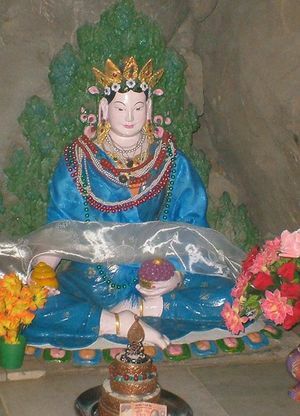 When the king found out, he cast her into a pit of thorns and tried to burn Guru Rinpoche alive. But through his magical powers, Guru Rinpoche transformed the pyre into a lake. When the king had repented his actions and granted them pardon, Mandarava accompanied Guru Rinpoche to the Maratika cave, where through their accomplishment of long-life practice, they saw the Buddha Amitabha face to face and attained the level of a vidyadhara with power over life. ↑ The Tibetans commonly suggest Mandārava instead of Mandāravā to be the correct spelling of the princesse's name. As pointed out by Van der Kuijp, the language of Zahor was different form Sanskrit. Thus if one wishes to take this into account Mandārava may be the better spelling of her name. Van der Kuijp, Leonard W.J., On the Edge of Myth and History: Za hor, its Place in the History of Early Indian Buddhist Tantra, and Dalai Lama V and the Genealogy of its Royal Family, (Shanghai: Zhongxi Book Company, 2013), 141.